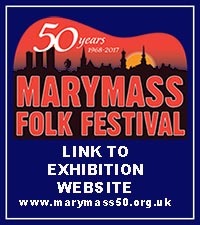 Tickets for the Marymass Folk Festival can be purchased online. We will send you an acknowledgement of your purchase and arrangements for collection of the tickets. These will normally be held for collection at the club or on the night of the relevant concert. All we need for collection is your Name and eMail address. – Payments are processed by PayPal but you DON’T need a Paypal account to check out, you can pay by any Debit or Credit card. Send a self-addressed envelope with payment (made out to Marymass Folk Festival) to: Marymass Folk Festival, c/o Joyce Hodge, 7 Machrie Place, KILWINNING, KA13 6RW or phone Joyce on 01294 551047 to reserve tickets.